Caladium ‘Lucky Purple’ is a captivating cultivar that was hybridised and grown from tissue cultures in Thailand. 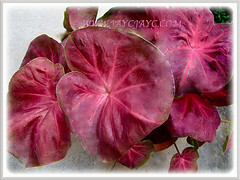 Its large and rounded heart-shaped leaves are truly spectacular with pinkish purple colouration and beautiful bright pink venation. Recently our potted Aglaonema cv. Valentine at the courtyard was discarded as the plants were frequently attacked by the mealy bugs. 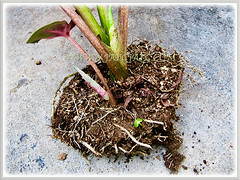 Thus, we decided to separate the potted Caladium ‘Lucky Purple’ into two pots to replace the Aglaonema. Moreover, we took the opportunity to separate them for this propagation project. It is to help beginners who may be clueless on how to go about it. It can be easily propagated by division of the tubers or offsets. The was one of our best times to propagate our healthy ‘Lucky Purple’ plants by division to achieve our desires. 1.Using a garden spade, carefully cut in a section of the plants. 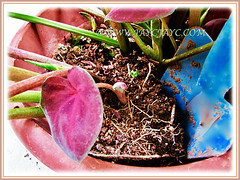 Place the pot on its side and gently remove the plants together with their roots from the pot. Fortunately, these plants have a shallow root system. 2. 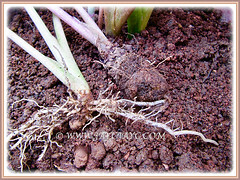 Check the condition of the roots to ensure that their roots are healthy. 3.Place the division of plants or offsets into a pot of quality potting medium, firm the soil around the stems and water thoroughly. Anyway, Caladium ‘Lucky Purple is not at all fussy about soil quality. Hence, any commercial packaged soil is suitable as long as it drains well. 4. Locate the pot at a sunny site that receives bright indirect sunlight. 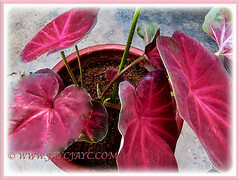 In due time, your plants should thrive well and very likely overstay since these Caladium ‘Lucky Purple’ are long-lived.